Swedish Massage is probably the most recognized and requested style of massage known the world over which consists of five basic movements; Effleurage - long, gliding and relatively light strokes. Petrissage - kneading dough is the best way to describe this stroke. Vibration - This rhythmic and gentle pounding method has a relaxing effect on the body and is akin to how a mother rocks her infant to sleep. Friction - circular motion used to break up tightness and release nagging scar tissue that has formed on muscle fibers. Tapotement - tapping, cupping or light pounding; usually used to end the massage as it awakens the muscles and the client; should they happen to have fallen asleep from this ultra-relaxing style. Easily 90% of my clients request this massage and are, for the most part, left feeling relaxed, rejuvenated, less stressed and ready to face the rest of the challenges of their day with an uplifted frame of mind. Sports Masssage is next on the popularity list. And, the great thing about this style is you actually don't have to be a world-class athlete to derive fantastic benefit from it. Whether you're an ultra-marathon running fit-as-a-fiddle fitness freak or a relative couch potato thinking about going for a walk around the block, there's something in it for you. The prime purpose of sports massage therapy is to help alleviate the stress and tension which builds up in the body’s soft tissue during physical activity. Where minor injuries and lesions occur as a result of overexertion or improper use, massage can break them down quickly and effectively. Above all, it can help prevent those nagging injuries that so often get in the way of performance and achievement and keep you away from your chosen arena of physical endeavor. Deep Tissue Massage is next on the popularity list. And, the great thing about this style is you actually don't have to be a world-class athlete to derive fantastic benefit from it. Whether you're an ultra-marathon running fit-as-a-fiddle "Fitness Freak" or a relative "Couch Potato" thinking about going for a walk around the block, there's something in it for you. The primary purpose of sports massage therapy is to help alleviate the stress and tension which builds up in the body’s soft tissue during physical activity. Where minor injuries and lesions occur as a result of overexertion or improper use, massage can break them down quickly and effectively. Above all, it can help prevent those nagging injuries that so often get in the way of performance and achievement, to the point of keeping you away from your chosen arena of physical endeavor. Myofascial Release Therapy The following is a description given by Dr, Trent A. Bauer, M.D. who answers questions at the website of the World Famous Mayo Clinic in Rochester, MN. Myofascial (my-o-FASH-e-ul) release is a manual therapy technique often used in massage. The technique focuses on pain believed to arise from myofascial tissues — the tough membranes that wrap, connect and support your muscles. Theoretically, myofascial pain differs from other types of pain because it originates in "trigger points," which are related to stiff, anchored areas within the myofascial tissue. The pain that a trigger point causes is often difficult to localize, though. During myofascial release therapy, the therapist locates myofascial areas that feel stiff and fixed instead of elastic and movable under light manual pressure. These areas, though not always near what feels like the source of pain, are thought to restrict muscle and joint movements, which contributes to widespread muscle pain. Reiki comes from the Japanese words “Rei” (spiritual) and “ki” (energy). Literal translation of “Reiki” means “spiritual life force.” Although it was first brought to the Western World in 1922 by a Buddhist Monk by the name of Usui, Reiki is an Eastern modality that goes back centuries and is one that deals more with spiritual energy than the typical Hands-On massage techniques. Far from "traditional" massage, with Reiki the client is fully clothed and the basic essence of it is the transference of healing energy from the practitioner to the recipient; it calls on both parties to be open-minded and accepting of positively transmitted human vibrations. 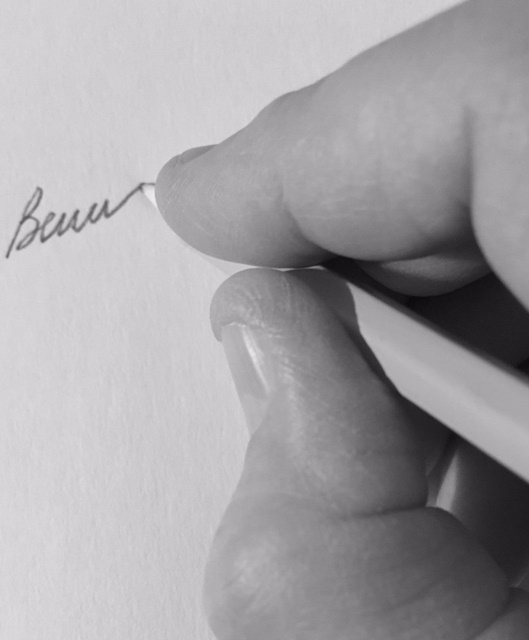 Instead of going into a long history of this fascinating practice, I've chosen a video for you to watch to familiarize you with a typical session. The strain/counter strain technique was initially discovered by an osteopathic doctor named Dr. Lawrence Jones. Dr. Jones identified tender points, which are tiny tender spots on the body that result from an abnormal reflex (unnatural movement). When sloppy movements (for example bad posture) are carried on for a number of years, eventually strain and injuries will develop.Once the practitioner is able to identify their patients tender points they will be able to choose a suitable strain/counter strain technique to help correct it.With strain/counter strain, Dr. Jones found that by using palpation and passive positional procedures, the therapist could restore pain-free movement. The gentle technique of strain/counter strain puts the client in a comfortable position for approximately 90-seconds. During this time the patients muscles will naturally reset to their proper positions. Its an important part of the healing process for the muscles to be at their natural tension and position before the strain/counter strain techniques are applied. Once the muscles are in their natural position, the strain/counter strain treatment is applied by the practitioner, who gently stretches the injured muscle in its natural position; while at the same time shortens the dysfunctional tender point so that it becomes rebalanced with the rest of the body. When the original position is resumed, the muscles are now realigned in their natural position and the pain should disappear. Strain/Counter Strain emphasizes the correction of abnormal muscle movements and placements for example if one hip or shoulder sits lower than the other. Dr. Jones identified flaws in many types of osteopathic therapy because he said that they simply attempted to heal the painful symptoms of misaligned muscles, but they didn't deal with the misalignment of the muscles themselves. Dr. Jones asserted that until muscle imbalances were dealt with, complete healing would never occur. Massage for Headaches is one of the reasons I decided to go to school to become a LMT. Headaches are the absolute bane of many peoples' existence. For a long time I'd had an intuitive sense about how to gently manipulate the skull, however, having the true science behind my methodology has encouraged me to share several important pointers with my clients with regard to specific touch they can apply to themselves on the spot when headaches, particularly tension headaches, occur. Massage for Headaches, taught by the incredible Rob Kelly, LMT, was one of my favorite elective courses I took while in school, and every single massage I administer includes at least a few minutes of cranial work. It feels great even if you aren't suffering any headache pain. Cranio-Sacral Therapy or (CST) as it is more commonly referred to, was pioneered and developed by osteopathic physician John E. Upledger following extensive scientific studies from 1975 to 1983 at Michigan State University, where he served as a clinical researcher and Professor of Biomechanics. CST is a gentle, hands-on method of evaluating and enhancing the functioning of a physiological body system called the craniosacral system - comprised of the membranes and cerebrospinal fluid that surround and protect the brain and spinal cord. Using a soft touch generally no greater than 5 grams, or about the weight of a nickel, practitioners release restrictions in the craniosacral system to improve the functioning of the central nervous system. By complementing the body's natural healing processes, CST is increasingly used as a preventive health measure for its ability to bolster resistance to disease, and is effective for a myriad of medical problems associated with pain and dysfunction. Reflexology Reflexology is a therapeutic method of relieving pain by stimulating predefined pressure points on the feet and hands. Thanks to the late, great Eunice Ingham, right here in the United States, for introducing us to this wonderful paradigm she created. This controlled pressure alleviates the source of the discomfort. In the absence of any particular malady or abnormality, reflexology may be as effective for promoting good health and for preventing illness as it may be for relieving symptoms of stress, injury, and illness. Reflexologists work from maps of predefined pressure points that are located on the hands and feet. 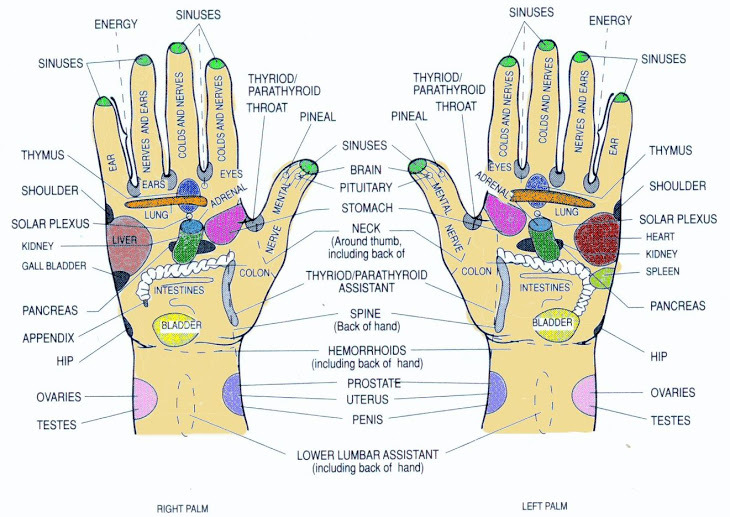 These pressure points are reputed to connect directly through the nervous system and affect the bodily organs and glands. The reflexologist manipulates the pressure points according to specific techniques of reflexology therapy. By means of this touching therapy, any part of the body that is the source of pain, illness, or potential debility can be strengthened through the application of pressure at the respective foot or hand location. I really enjoy seeing the faces of clients when, in mere moments, they look at me and say with near disbelief "I don't have that pain anymore!" 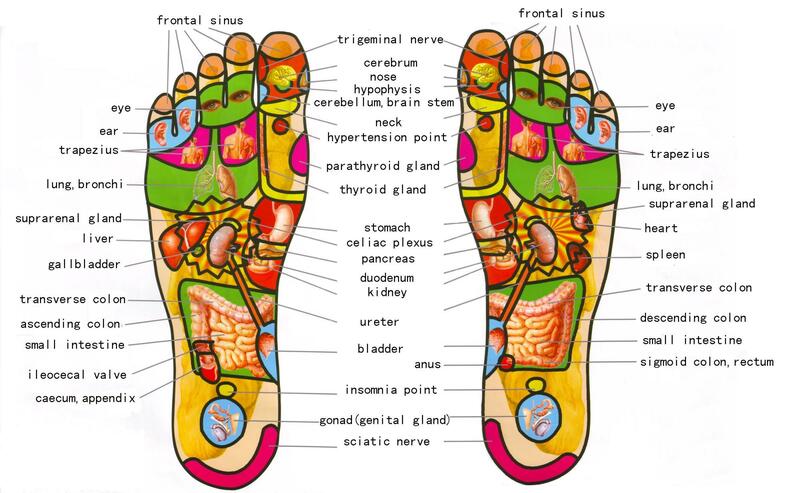 What's so incredible about reflexology is how the parts of the feet and hands are proportionally connected from the top of the head to the tip of the toe as far as the parts of the human body are concerned. If you look at the below charts, you'll notice that the tips of the toes are the reflexology points for the top of the head and so forth as you go from top to bottom on the foot. I can't wait to show you how awesome this technique feels and ultimately works. Don't forget to watch the video underneath the charts; not only is it thoroughly informative, the music's pretty sweet as well! CAN EXPECT FROM YOUR PERSONALIZED MASSAGE SESSION! If you are anything like I was prior to the education that led to achieving my Massage Therapist License, you might have felt that the only real difference between massages was the degree of pressure that was being applied by the person performing the bodywork on you. I WAS QUITE WRONG ABOUT THAT! Therefore, instead of simply listing the types of massages that I am trained to provide, I thought I'd give a brief explanation of each; to better help you decide which modality you would like to receive, or at least furnish you with certain information that might have been foreign to you up until now. I've also hand-selected a few videos that do a great job of demonstrating precisely what you can expect from modalities that are, in some instances, considered "alternative" treatments, should you select that particular option for one of your sessions. Try not to let the terminology intimidate you; I've basically provided those clips that appear instructional by nature so you can see what the actual strokes look like and how they are performed within their specific type of massage. A firm grasp of anatomy, physiology, pathology, nutrition, and a myriad of healthful paradigms in general are in the hands of any massage therapist worth their salt. Therefore, from massage to massage, and often during each session, as they become clear to me - I will integrate a variety of techniques that are appropriate and beneficial to your overall physical and mental condition. I hope one day you will entrust me to perform essential bodywork on you, and I promise it will be the best possible massage I can deliver to you each and every time out! Canine Massage - That little guy below is cute, but don't laugh too hard. Our canine friends have similar anatomy to humans, believe it or not. They have a few more vertebra in their spines than we do and rather curiously those extra vertebra are in their tails. When we were growing up we were always told "Never pull a dog's tail, you'll make it angry and he or she may bite you!" As a matter of fact, dogs LOVE having their tails straightened out and pulled; it relaxes them and sometimes even puts them to sleep. I've experienced that during several canine massages. There are some really cool tricks that you can try out on your own "best friend" which will prove me accurate. Place your hand on the animals backside close to its tail, and softly at first, straighten out its tail. Then, once the tail is horizontal to the floor, massage around it in circular fashion from top to bottom and watch how at ease your pet becomes. Next, and I love this one, massage the inside of its ears. For the most part, humans get annoyed if another person sticks their finger inside their ear and moves it around, but dogs enjoy it immensely. The reason being, a dog's inner ear is just about the only place that it cannot get to and have a scratch! Anyway, I am licenesed to perform canine massage and I'd be happy to demonstrate its effectiveness. And, while you're watching me at work, I'll encourage you to take notes; so from now on you'll know how to massage your own dog and won't need me anymore. How's that for drumming up business only to quickly lose it afterward? I've said many times throughout this website, I massage because I love it, and if anyone can benefit from what I do, that's pooches included, I'm a happy guy! PS: I don't use a blender with an egg beater on it when massaging Fido or FiFi! Infant Massage - I remember when I became a daddy. It probably took me two months to dare let my own mother pick up our son, let alone another family member, friend or heaven forbid a total stranger! So, it's not hard for me to understand why new parents are reluctant to hand over their child for a 20 minute long massage. To this day, I would be too! But, all of us were babies before we became kids, before we became teenagers and finally adults, and the benefits of massage to the newborn are wonderful to behold. May I suggest you watch the video below and then try out renowned licensed massage therapist and instructor, Susan Salvo's techniques on your child. Let her show you the process she goes through on her handsome little client. If anyone would feel comfortable performing massage on a child it would be its mommy and daddy, after all, they were the ones who just went through the nine month long experience of bringing the tiny person into this world. I do provide infant massage services, and, candidly, I probably derive greater joy from helping calm babies down who are battling with colic than from most techniques I use with adults. If my parents knew about infant massage when I was going through a screaming bout of colic they likely would have had more sleep and less stress themselves as a result of calming me down. Alas, don't worry...I stopped having issues with colic right around my 47th Birthday! !